Biographical Details: Born in Brandon, Manitoba in 1934. Moved to Victoria, BC in 1938. BA (Honours) in German, UBC 1957. MA in German, U of California (Berkeley) 1959. 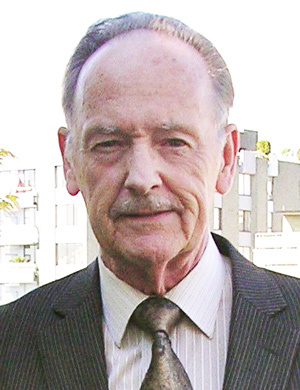 Member of UBC's German Department (later Department of Germanic Studies) 1961 to 1996. Prior to contact with Europeans the Sechelt Indians' territory extended from the head of Queen's Reach in Jervis Inlet to the western entrance of Howe Sound on the British Columbia coast. In 1985, UBC's Ronald Beaumont published a grammar guide for the Sechelt language, she shashishalhem (Theytus, 1985), complete with English-to-Sechelt and Sechelt-to-English cross-referencing. It has been followed by the 1,000-page Sechelt Dictionary (Sechelt Indian Band, 2011), a mammoth undertaking based on material Beaumont collected during a forty-year period from 1970 to 2010. "My interest in North American indigenous languages was sparked by some Linguistics courses that I took in the late 1950s while I was pursuing graduate studies in Germanic philology at the University of California in Berkeley. "Back in Vancouver and teaching at UBC, I learned, in 1969, from acquaintances involved in the recording of BC Indian languages that nobody was currently working on Sechelt. With the permission of then Chief Henry Paull I started recording Sechelt language material in 1970. I knew that Sechelt, like a number of other indigenous languages, was almost extinct, and I believed that the extent of my avocational service would simply be to add whatever I could to the existing archival documentation of the language. "This rather bleak view began to change in the late 1970s, when I was asked to create a Sechelt language course for the newly developed Native Environmental Studies Program for high school students. Prior to this I had worked with individual informants, but now I found myself meeting regularly with a few Sechelt elders who functioned as consultants for the project. This committee, spearheaded by the late Clarence Joe, showed a keenness that I had not expected. "The Native Environmental Studies Program was short-lived, but the language committee's enthusiasm was not. The elders became convinced that we should be teaching all the kids, starting with the very young, the language of their ancestors. As our work progressed, I was amazed at how much of the language was being recalled. Soon the language was being taught at the nursery school on the reserve and in the local public schools. And I was working on a pedagogical grammar of Sechelt. "Looking back on all of this, I think that our work was an important part of a Sechelt cultural revival that was beginning to blossom at that time. We realize that the Sechelt language and its use can never be completely restored, but-as we have already experienced-even a modest revival of it is of enormous significance to the Sechelt people in maintaining their cultural identity. After the publication of she shashishalhem: The Sechelt Language in 1985, the language committee (now quite a bit larger) decided to start work on a dictionary of Sechelt. Even then I knew that this was going to be a much bigger project. We still had to get a lot more information, and this kind of work was slow going. Also, I could not devote more than a few hours each week to analysis and filing. "The actual writing did not begin until 1995, a year before I retired from UBC, and I was still gathering and analysing material until shortly before completion in late 2010. In order to make this accumulating information available to the language committee and the teachers, I provided them with a computer printout of my latest version almost every year until 2008. "Possibly the greatest challenge for me was to make the information in the dictionary more accessible to the lay reader by avoiding the use of technical terminology. This took a lot of thought and time. I don't know if I succeeded in this, but I certainly enjoyed trying! "Finally, I have to say that from beginning to end I have enjoyed the friendship, cooperation, encouragement, and patience of people at every level within the Sechelt Nation. This made, and continues to make, working with them a pure pleasure." The territory of the Sechelt people, who call themselves shishalh, lies between the head of Queens Reach in Jervis Inlet and the western entrance of Howe Sound on the south coast of British Columbia. Neighbors to the west and east are the Sliammon people and the Squamish people respectively. In early times the Sechelt people consisted of four main groups with settlements at Pender Harbour (kalpilin), at Deserted Bay (ts'unay), at the head of Queens Reach in Jervis Inlet (xenichen), and at tewankw near Porpoise Bay in Sechelt Inlet. The last group had resettled from Narrows Inlet after their village there was destroyed by a rockslide in the early nineteenth century. The present concentration of the Sechelt population in the village of Sechelt (ch'atlich) had its beginnings in 1868, when Father (later Bishop) Paul Durieu of the Oblates of Mary Immaculate set about to centralize the various groups here in what was intended to be a new, model community that the missionaries could more easily minister to, convert, and supervise. The Sechelt language (shashishalhem) belongs to Northern Coast Salish, a subgroup of the Central division of Salishan languages. In the nineteenth century the vocabulary of Sechelt, like that of its neighbors, began to change markedly. As the presence in this area of European immigrants made itself increasingly felt, new words came into the Sechelt language to describe the various things introduced by the newcomers. Many of these additions to the Sechelt lexicon were loanwords from English or French (some via Chinook Jargon) like stenput 'steamboat', lekli 'key', and sesta 'nun'. Others were loan translations like chechimali 'fireplace' and ts'exwawtxw 'washroom', as well as existing words used with extended meanings such as hiwus 'boss' (chief), sts'exwit 'baptized' (cleaned, washed), and xelem 'write' (mark things). These and other types of word-creation-often quite imaginative-have continued to enhance the Sechelt vocabulary well into recent times: kwakwal kw'axwa 'radio' ("talking box";), selimshin 'bicycle' ("spinning feet";), ts'exwulnisten 'toothbrush' ("wash teeth device";), xwalitenulh yenis 'dentures' ("white man type of teeth";), ~i~imash stitenput 'railway train' ("walking little steamboat";). Such innovations enriched the language and reflected an openness to the outside world. Sadly, this world was not as open to the Sechelt language. In the last half of the nineteenth century life for most Sechelt people changed in ways that had a lasting adverse effect on their culture. And their language, being the voice of their culture, must have suffered as well. Under the Durieu system, which prevailed for several years, the lives of the newly converted Sechelters were severely restricted. The people apparently took up the Catholic faith and its rituals with enthusiasm, but in so doing they had to give up cultural traditions (dancing, potlatching, shamanism, etc.) that were in conflict with church dogma. In the secular sphere the Sechelt people were also under pressure to abandon their own traditions and values in favor of imported ones. It is hard to gauge the extent to which such early cultural losses affected the language. We do know that hardly any words have been preserved from what must once have been a rich vocabulary relating to such subjects as ceremonies, costumes, traditional dancing, potlatching, spirit quests, gambling games, etc. Early in the twentieth century a single, precisely identifiable event occurred that marked the beginning of a rapid decline of the Sechelt language: the opening of St. Augustine's Residential School on the Sechelt Indian Reserve in 1904. The school, one of many in the country, was financed by the federal government and run by members of the Oblate order, and its purpose was not only to educate the native children but also to assimilate them into white society by eradicating their language and other aspects of their culture. Children from the age of seven to about sixteen (with some exceptions, depending on individual family circumstances) were compelled to reside at St. Augustine's, where their days were taken up by schoolwork, manual labor, and religious observances. Being permitted only brief visits to their homes on Sundays and having just a few weeks off in the summer, these children were, in effect, cut off from their families and their traditional way of life for most of each year. On top of all this they were required to speak English in school and were punished if they used their own language. This was probably the most devastating restriction of all, because it impeded communications between the generations during the limited times available for the children to spend with their families. Before long the linguistic interference of English was sufficient to cause some parents and grandparents to accuse the children of making up their own Sechelt language. The policy of language suppression in St. Augustine's Residential School was ill-considered and harsh, but it was not the only factor in the decline of the Sechelt language. Since the majority of immigrants who settled over the years in Sechelt territory were English-speaking, English became the dominant language in the area. And the Sechelt people, now a minority in their own lands, eventually had little choice but to interact with the English-speaking community in many sectors of daily life. Under these circumstances it was inevitable that the Sechelt people would learn English in order to survive in a world that was becoming so different from that of their ancestors. As the years passed, English was spoken more and more, even at home, until it finally became the first language of the new generations. And so it is that today all Sechelters speak English, and the only ones with an appreciable knowledge of their ancestral language are a few elders, some dedicated younger teachers who are learning as they go, and-happily-a flock of enthusiastic young students. The impetus to start teaching the Sechelt language to young people came with the development of the Native Environmental Studies Program in the late 1970s. This program, jointly sponsored by the Sechelt Indian Band and School District 46, was designed to operate at Deserted Bay and to involve small groups of native and non-native students in grades nine and ten for eighteen weeks of their school year. One component of the curriculum was to be a course on the Sechelt language, and I was asked if I would be willing to create a series of lessons for such a course. Having recorded a considerable body of Sechelt language material since 1970, I was eager to oblige. In the fall of 1978 a few Sechelt elders met with me to act as language consultants for the project. Soon more elders joined the group, and a language committee was formed. As our work progressed, we became convinced that we needed to go beyond the requirements of the Native Environmental Studies Program. We believed that the Sechelt language should be taught to students at every age level, and that it was especially important to start with the very young children. If this were to happen, we would obviously have to widen the scope of our efforts and somehow create a source of Sechelt language material that would match the abilities and needs of children from preschool to secondary school. With this in mind, I started work on a pedagogical grammar of the Sechelt language. The book, which was published in 1985 under the title she shashishalhem, the Sechelt Language, employs Bouchard's practical spelling system and contains grammar units, Sechelt texts, conversational sentences, and a glossary. It was designed to serve as a textbook for mature students and also as a resource for course development at all levels of instruction. Even before the publication of she shashishalhem, several elders had become involved in the teaching of their language in the nursery school on the reserve and in the elementary school (Sechelt Elementary) and the secondary school (Chatelech) in the town of Sechelt. They were breaking new ground, and the work was not easy for them. It should not be forgotten that these elders had, as children, been forced to attend the Residential School, where the use of their own language was forbidden. Having lost some of their language skills and being untrained as teachers, they found it doubly difficult to teach their language despite their strong motivation to do so. But they persevered, taught for several years with great success, and also created a substantial amount of new and interesting material for their students. A major event in this long struggle to revive the Sechelt language, due largely to the efforts of Language Coordinator Donna Joe, was the approval in June 2000 of her submission for accreditation of Sechelt for high school graduation and university entrance. And now, at the time of this writing, most of the surviving elders who started teaching in the 1980s are still active as language consultants, but have passed the baton to a small group of younger teachers who, although still learning the language themselves, are bringing great enthusiasm and fresh ideas to their task. Thanks to the commitment and hard work of these new teachers, a long-interrupted linguistic continuity between the generations is being re-established. After the publication of she shashishalhem in 1985, the elders' language group decided that we should make every effort to document as much as possible of the Sechelt language while we could still do so. Our new goal was to compile a dictionary based on material already recorded, along with whatever else could be remembered. Working with a group of language consultants was much slower than with a single informant, but it turned out to be more rewarding. Some elders in the group knew more than others about certain things (cooking, fishing, hunting, etc. ), and they were all eager to share their knowledge. Discussions, although time-consuming, often led to the retrieval of words that people had not heard or thought of for years. To be sure, many words have been forgotten or recalled incorrectly, and some grammatical constructions have not remained intact. Nevertheless, one has to be amazed at how much has been remembered and agreed upon by the members of the elders' language group. The dictionary has been a "work in progress"; for a very long time. This is due partly to the state of the language and the circumstances of elicitation. Also, a good deal of checking and re-checking was necessary because of information that sometimes turned out to be inconsistent, or because of misinterpretation on my part. Another reason for the slow progress is that this project has been an avocation for me. Knowing that the work would take a few years even after I started writing, but not wanting to withhold the results of my compilation until the point of completion, I decided to provide the elders' group and the teachers with a computer printout of the latest stage of the dictionary on an almost yearly basis. Between 1995 and 2008 they have had twelve versions at their disposal. Developing the dictionary in stages like this had the advantage of allowing us to test it through use as we proceeded. Errors, ambiguities, inconsistencies, gaps, etc. that were identified in one version could be discussed and then remedied in the next version. This process involved a good deal of deliberation and took a lot of time, but it was time well spent. The Sechelt Dictionary is based on material that I collected during a period of forty years, between 1970 and 2010. At first I worked with individuals: Cecile August, Jennie Erickson and Sam Johnson. From 1978 on, the Sechelt elders' group provided me with information about their language. I also consulted the following sources: the Sechelt vocabulary collected by Franz Boas in 1886, the Sechelt language material published by Charles Hill-Tout in 1904, the word-lists compiled by Randy Bouchard in the 1970s, the word-list published by Jan Timmers in 1977, and Timmers' unpublished Sechelt stem-list of 1978 (see: Selected Bibliography). Words from these outside sources were included in the dictionary if they could be verified by my consultants. In writing this dictionary I have tried to keep in mind that my first responsibility is to the Sechelt people who will be teaching and learning the language of their ancestors. The result of this focus is a work that may seem a bit out of place among its cousins in the small world of Salish dictionaries. Since the vast majority of Sechelters now speak English as their first language, it seemed logical that the main part of the dictionary should be the English-Sechelt section, not the Sechelt-English section. Also, having observed over the years that most people-aside from grammarians and linguists-have an aversion to learning grammatical concepts and the associated terminology, I decided to avoid the use of technical terms in this work. The main difficulty caused by this approach was with certain word-endings, many of which could not be dispatched with succinct definitions. Such endings are listed in the Sechelt-English section, where they are illustrated by examples and/or cross-referred to specific sentence-patterns (paradigms) in the Appendix. Another deviation is the inclusion in the English-Sechelt section of entries with headwords like "emphasis";, "exclamations";, "future";, "past";, "questions";, and "requests";. These and other departures from usual practices are, in my view, justified if they make the dictionary easier to use. Although the Sechelt Dictionary is intended primarily as a resource for a revival, however modest, of the Sechelt language, there is also the hope that it may be of interest to the general reader, and that Salishanists will find the data useful. In the twenty-five-odd years since the publication of she shashishalhem, my knowledge of the Sechelt language has become somewhat more refined. So, naturally, there are discrepancies between that work and this one. Where such differences are found (in spellings, definitions, etc. ), the relevant items in the Sechelt Dictionary should be regarded as representing my latest views.